Do Your Homework: How to Find Out About Company's Environment #Infographic - Your journey to a new career. Employee engagement can be the difference between enjoyable work environments and frustration, but how would you know which job would be best? It turns out that finding a job in an engaged organisation can be as easy as talking to the employees before your first interview. Do the employees sing praises about the leadership and the company or do they have an exhaustive list of complaints? This could be the easiest way to eliminate those companies with attractive facades that are crumbling internally. Engaging companies generate enthusiasm from within, encourage collaboration, and feel more genuine than disengaged organisations. If you manage to land a job here, you’ll likely feel excited to work, feel appreciated, and take ownership of your career within the company. The cycle of positivity begins with the employer’s own ability to promote genuine excitement, then it continues through all employees in order to create a community of engagement. 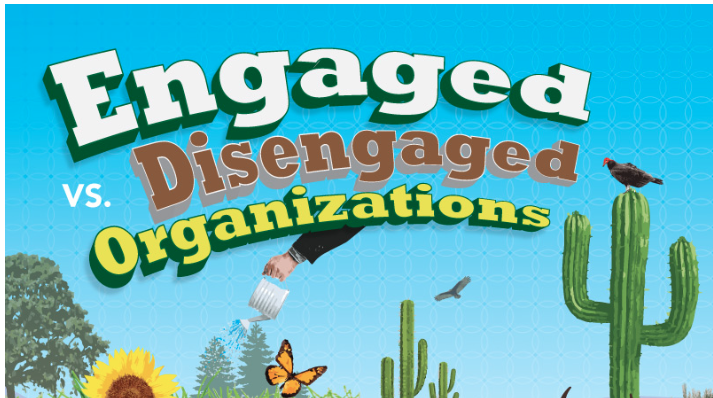 Contrasted with a disengaged company where employees are distrusted, disrespected, tired, and disconnected, an engaged company can feel like a dream come true. Disengaged companies will often have a revolving door where loyalty to the company is superficial and often linked to the potential for retirement. Any enthusiasm at these companies is usually only local, or experienced by a very small subset of the staff members, or is disingenuous. Starting at the bottom, asking questions about the company’s climate, and paying careful attention to the authenticity of the answers you receive can save you major headache.